When I first created this site, I thought of ways of decorating a man cave that would replicate my favorite bars or pubs. I have been to a variety of bars and pubs around the United States and Europe, experiencing different atmospheres and environments that related to a variety of themes that many love and adore. With so many different bar and pub styles, it was overwhelming to think of what concepts I could use to incorporate into my own man cave. With these experiences, I have broken down the best pub themed man cave options that you can incorporate into your very own man cave! One of the best memories of most people’s pub experiences is the billiard tables and dart boards. 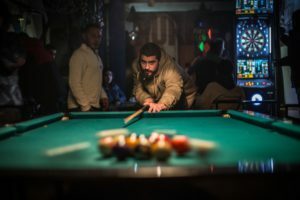 Whether you are a pool shark or just a simple person looking for a friendly game to unwind, there are always those places you can go to have a good day or night out. Why not bring that level of fun and concept of unwinding to your very own man cave? I have recently posted a review of a variety of pool tables that can be used to turn your boy cave into a man cave, but those are just a minor piece of the puzzle! The billiard table is the center piece of the room, creating an area for guests you have over to have a drink and unwind from the daily stress of a 9 to 5 job or life stresses. However, many forget that this is only a fragment of the overall experience that makes a pool bar themed pub the place to be! Proper lighting and wall decor and the ideal pieces that will separate your man cave with a random pool table to an actual pool bar. Pool bar lighting and wall art revolving around music or beer related themes are ideal when you want to elevate the appeal of your in home pub. Most of the major beer companies have a plethora of options in relation to pool table lighting and wall art. If you were to do a quick Amazon search, you would find a variety of pool bar options that not only add value to your man cave, but that special ambiance as well! In addition to your lighting and wall art, do not forget the importance of adding specific bar stools to help you and your guests enjoy the atmosphere without the issues of generic wooden kitchen chairs. Get the bar stool that fits your style and make the bar a secondary centerpiece. If a pool bar pub theme isn’t your style, perhaps our next option fits your preference! There are a few times each year when a few buddies of mine from high school and past jobs meet up to catch up on what has been happening over the last few months. In these moments, we tend to sit back, relax, light up a cigar and have a few drinks. 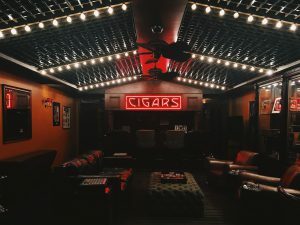 With so many places out there not allowing cigar smoking (or any for that matter) on their premises, it is becoming a task trying to locate the ideal spot for our meet ups. Beer is usually overpriced and there are always external noises coming through from drunk people in the pubs or restaurants we go to. My buddy mentioned that he found this “killer spot” that gives us the sanctuary we desperately needed. What’s better? We can order almost anything without having to pay an arm and a leg as long as we tell him beforehand. We came to find out that he had converted his basement into the ultimate cigar and beer pub! The main room of the basement had been renovated to include a bar, entertainment area with two televisions, and various chairs around the room for us to relax and catch up. In addition, the side room was opened up to allow for us to have seating and open air for our cigar session. People don’t realize how easy it is to convert your man cave into what it is you truly want. In this case, we all needed a place to relax and catch up. My friend took it upon himself to convert an area of his house into a man cave that not only he enjoys, but one that everyone else can as well. In addition to the furniture and bar additions I mentioned before, we have since been bringing over one wall decor gift each time we meet up. There are now posters of a variety of different beers and cigars. Additionally, I got him some custom cushions for his bar stools (which I got through here) and helped get him bring together the overall cigar and beer theme. If this is a little too generic for your man cave, we have options that relate to the decade of your choice. 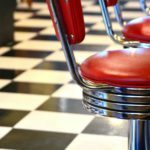 60s: Checkered patterns, Wrap around bars with stationary bar stools. Large glasses and malt shakers. Jukeboxes! There are so many iconic things found in this decade, all of which can be incorporated into your man cave. Add in some posters of coke, Pepsi, or pin up items and you are set! Don’t forget to add a little classic car feel in there as well, whether it is with your furniture setup or incorporated into your wall decor. 80s: The era of the fantasy genre. Star Wars, Star Trek, Back to the Future, and many more! This was the decade where peoples versions of what can exist expanded past what does exist. 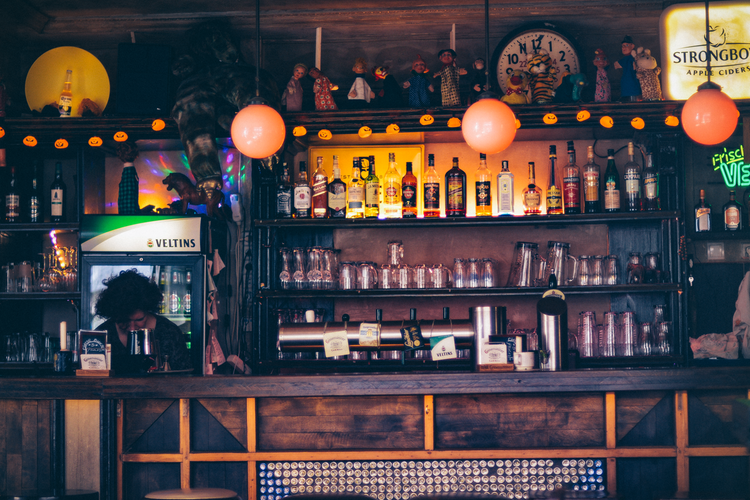 You could have so much fun with this decade, as there are some of the most memorabilia wall art, bar capabilities, and furniture options that can be found all over. If you are a bit stumped, take a look out our page HERE and get a feel for what options exist. If these decades aren’t in your idea of what you are looking for, you can focus on any other – these just happen to be the most popular from recent polls taken online and from university studies. With that said, let’s move on to the other end of the spectrum – the apocalyptic end. Steam punk and apocalyptic memorabilia has been growing over recent decades due to the emergence of a variety of television shows and movies. Combine that with a variety of social gatherings revolving around this theme and you get a mass production of products for your man cave! 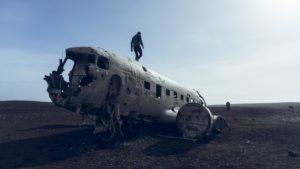 Whether your version of the Apocalypse is something of the Mad Max, Walking Dead, or American Horror Story nature, there are a variety of options for you out there. Industrial furniture made from scrap metal or other common products enables you to decorate and furnish your room for cheap with an artistic flair. Additionally, you can take something from a junkyard like a hubcap or steering wheel and convert it into a clock face. This concept can be used for anything else in your man cave, but ideally for wall decor. There are so many things tossed aside in landfills and junkyards -this is exactly what most envision in their apocalypse. Why not use that to your advantage by taking these tossed away “junk” and make something from it. That is what everyone does in the movies and television series right? Let’s say you don’t think the apocalypse is near and the future will actually be bright – we’ve got that covered too! With so many commercials and movies out there revolving around the future, many of us out there have had at least one instance in which we contemplate what the future would actually look like. Rather than fantasizing about what could be, let’s take about what can be! The concept of creating your own path, your own future, has been a motivational factor for many in the world today. Take that ideology and convert it into ways in which you can decorate your very own man cave! 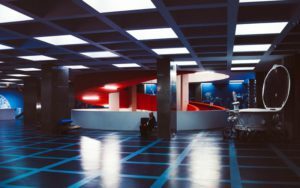 Whether you are a Star Wars, Star Trek, Jetsons (insert laughter here), or any other futuristic fan, there are a variety of to-do’s out there that you can incorporate into your own man cave. We have already touched on wall decor art and lighting capabilities, but the concept of futuristic furniture and bar capabilities has yet to touch the surface. LED lighting is an amazing option for a bar setup as it give the futuristic feel without emptying your pocket. Combine that with an industrial style bar, entertainment center, and furniture and you have a futuristic room that is secondary to none! You can find a variety of old school metallic memorabilia (like barber stools and propellers for instance) that can be converted into futuristic props for your man cave. Yard sales and antique shops have these in a variety of options – converting what you find into something more takes little effort but a great imagination! Use what most view as waste and make something with a futuristic feel, granting you the perfect furniture or decor with limited out-of-pocket expenses. There are far too many ideas to mention here for the futuristic theme, but I would rather let the ideas linger since your version of what is and is not futuristic may differ from that of others. Make the future what you want it to be. Whether that is a future of desolate or a future of space-like ambiance, make it your own and stand by it, as once the future is made, it becomes your sanctuary! Let the Pub Crawl Begin! Whether you are going for a billiard theme, cigar and beer pub theme, decades, or apocalyptic/futuristic theme, there are a variety options out there to make your man cave stand out in ways you only dreamed of. Turning your bar into a major centerpiece, creating exceptional lighting and entertainment, and adding wall decor are the perfect methods to which you can turn your basic man cave into something unique and memorizing. If you have any questions or comments regarding pub themed ideas, feel free to leave them in the comments section below! Thank you for the response. I love the concept of the futuristic style, as we can choose whatever we want- our versions of the future are unique compared to that of others! I’ve been looking for ideas for my “she shed!” I like the Apocalyptic theme and will be working on this very soon! My Apocalyptic theme could kind of blend with the Futuristic one and that might make an interesting pairing! Thanks for the information and the ideas! I love the concept of meshing the Apocalyptic and Futuristic theme! In theory, the future could be an apocalypse, so it makes total sense. If you wanted to go a bit further, you could do half of your she shed futuristic and half apocalyptic and cover both ends – basically showing two versions of what our fates may be! I loved reading your article! That’s so cool, of all the different ways you can set up a man cave. I might, one day, have to build myself one, because man those look sweet. Is it fairly popular for men to do this? I never really knew that guys would go so all-out in designing and putting together their man cave. We (men) don’t get much say in terms of certain rooms, but this is the one room that is becoming popular in terms of going all in. The pub themed options allow us to format the man cave into a common theme as opposed to comic or sport specific ones. Take a look around the site if you are contemplating creating your own and you can gather an idea of what other options are out there as well! At the moments its a bit basic with just a bar and a dart board on the wall so needs a bit of imagination that’s for sure, I love the pool bar theme and you have very kindly listed a few things that will definitely bring the ambience together nicely. I have bookmarked this article. Thankyou! Thanks for the read! I love the billiard aspect, as it allows not only a place to unwind but also a place to kick back and play a game as well! For the girls allowed type of man cave, I posted a few articles on she sheds and she caves should you want to take a look! Woah this is pretty cool. I particularly like the futuristic one because I like dem LEDs. I love the futuristic theme, as you can make it whatever you want! You can even combine it with apocalyptic themes and create a future of chaos! I love your idea of a human sized transformer – it is unique and easily doable! The LED aspect is awesome – I added LED lighting for my bar and it brought it to a whole new level!